Jackie Krasuski submitted this photo and caption. 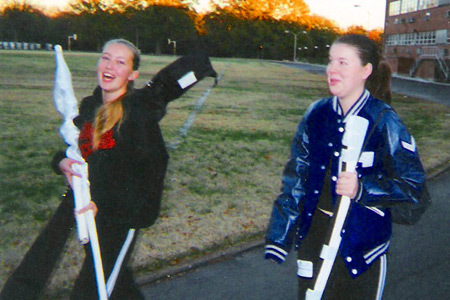 This is a photo of me (left), and Samantha Stepp (right) at our first-ever drum corps audition at Memphis Sound back in November 2003. We basically gravitated toward one another at that audition, and even though I went on to march with the Blue Stars in 2006, we have still been great friends ever since! Now that we have aged out, Sam even drove all of the way up to Missouri to help me teach at Spintronics, a camp for color guard students in rural high schools. You really do meet the best friends you will have for your whole life at drum corps!